1. Smooth running: Rotaries delivered power very smoothly because (relative to the engine mounting point) there are no reciprocating parts, and the relatively large rotating mass of the cylinders acted as a flywheel. 2. Weight advantage: many conventional engines had to have heavy flywheels added to smooth out power impulses and reduce vibration. Rotary engines gained a substantial power-to-weight ratio advantage by having no need for an added flywheel. 3. Improved cooling: when the engine was running the rotating cylinder block created its own fast-moving cooling airflow, even with the aircraft at rest. Most rotary engines were arranged with the cylinders pointing outwards from a single crankshaft, in the same general form as a radial, but there were also rotary boxer engines and even one-cylinder rotaries. Like radial engines, rotaries were generally built with an odd number of cylinders (usually either 7 or 9), so that a consistent every-other-piston firing order could be maintained, to provide smooth running. Rotary engines with an even number of cylinders were mostly of the "two row" type. Image below shows two views of a Gnome Rotary Engine. Rotary and radial engines look strikingly similar when they are not running and can easily be confused, since both have cylinders arranged radially around a central crankshaft. Unlike the rotary engine, however, radial engines use a conventional rotating crankshaft in a fixed engine block. Note that colors (Red, Orange, Blue and Yellow) showing engine operation distributed evenly on the image for Radial Engine. 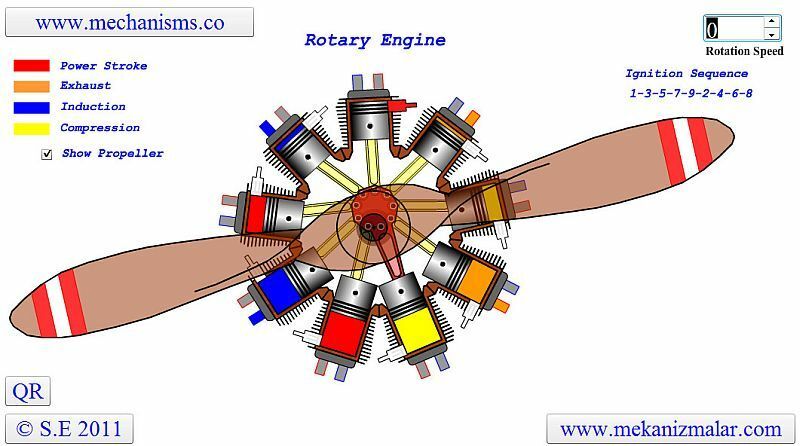 For the Rotary Engine (Red and Blue) are on the left and (Orange and Yellow) are on the right of the image. Can it be posible for we from Tanzania to have these Trainings? I'd like to understand it before I die.